Next week I hope you will join me, when I will be kicking off a month of recipes that feature wild foods! It is also St David’s Day, the national day of Wales. So the first recipe will not only be wild, but with a Welsh twist to it also! But in the meantime this week I am finishing off a month of spices . . . . .
How could I follow up the chile column and also finish this month of spices off without talking about the peppercorn? What a spice! Peppercorns are the seed berries of the piper nigram vine (piper being Latin for plant, and nigrum meaning black) originating on the Malabar coast of India. The active ingredient in pepper that makes us sneeze, cry or run for a cold drink is called ‘piperine’ of which a mere twenty parts per million can be detected, they are not only the oldest used spice, but also the most widely-used. 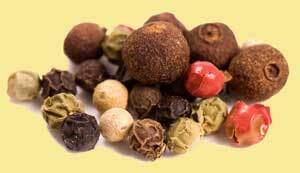 During the Middle Ages, peppercorns were worth their weight in gold. Wealthy aristocrats kept stores of peppercorns as collateral, since everyone recognised their value , they were accepted as payment for rents and debts. Original exploration voyages to the Far East were initiated in search of valuable spices such as pepper. Pepper was considered one of the five essential luxuries upon which foreign trade with the Roman empire was based, the others being African ivory, Chinese silk, German amber, and Arabian incense. You may have heard the term "peppercorn rent"? Used often to denote a mere pittance, but in medieval times in was far from a pittance; a pound of pepper was in fact the equivalent of a pound of gold. In 408 A.D. when the King of the Visigoths put his demands forward for the release of the city of Rome, three thousand pounds of pepper were part of his ransom note, so was the power of the peppercorn. But although prized as a flavour-enhancing spice, they actually first gained as a digestive stimulant and expectorant. Pepper was also used in ointments and salves to relieve skin afflictions and hives. There are a few types of peppercorns that you will find on your supermarket shelves: the black, white, red and green peppercorns are all the seed of the same plant, that are in various stages of maturing and processing. The berries grow on spikes, with fifty to sixty berries per spike. Cayenne pepper is not included here as it is actually a capsicum, related to chile peppers and the fragrant Szechuan pink pepper I will cover at a later date. You may think that these are the mature fruit of the plant, but in fact they have reached their full size, but are not quite ripe. They are picked and allowed to dry in the sun. Enzymes in the berries cause the skin to turn black during the drying process. Strongest in flavour. These are actually the mature berries which ripen to a red colour before being picked. After harvesting, they are soaked and rubbed free of the outer skin down to the smooth white under layer, then dried and bleached by the sun. Slightly milder than black pepper. Picked at the same stage of ripeness as black peppercorns, but not allowed to dry. Their flavour and spiciness is less concentrated than black peppercorns, and generally found pickled in vinegar or a brine. They are soft in texture due to the pickling. This mature, but un-hulled version of the peppercorn is more often difficult to find. In spite of its moniker, these are unrelated to the black peppercorn. They come from the baies rose plant (Euonymus phellomanus), imported from Madagascar and as a result, expensive. They are pungent and slightly sweet, but not nearly as flavourful as the real thing. These berries were once banned by the Food and Drug Administration as a foodstuff, but are now considered safe for consumption. This seed is not to be confused with the Brazilian pepper berry below. Also often called pink peppercorn, this berry is also unrelated to the black peppercorn. It is the seed of Schinus terebinthifolius, also known as Brazilian pepper tree, Christmas berry and Florida holly The flavour is hardly spicy hot, but more of a sweet menthol and resinous nature. This berry causes allergic reactions in some, particularly children and can be toxic in large quantities. Not recommended. My recipe this week is for a savoury dish, but if you would like a sweet dish with peppercorns <click here>. I kid you not, some peppercorns; in this case the soft green peppercorns lend themselves wonderfully to fruits . . . strawberries, pineapple and pawpaw in particular! Pepper is not for everyone of course and we all have our own tolerances for its heat. The ingredient amounts given here are for a piquant flavour, not too strong but with a definite bite, please adjust to suit your own taste.